DBHawk is a web based SQL Tool specially designed for Oracle, SQL Server, MySQL, PostgreSQL and Amazon RDS. It allows connecting multiple databases through a single web browser window with seamless SQL development experience. DBHawk provides true Browser based access, NO SQL Client Tool is required – so you save time and money on SQL client software as well as maintenance across your enterprise. 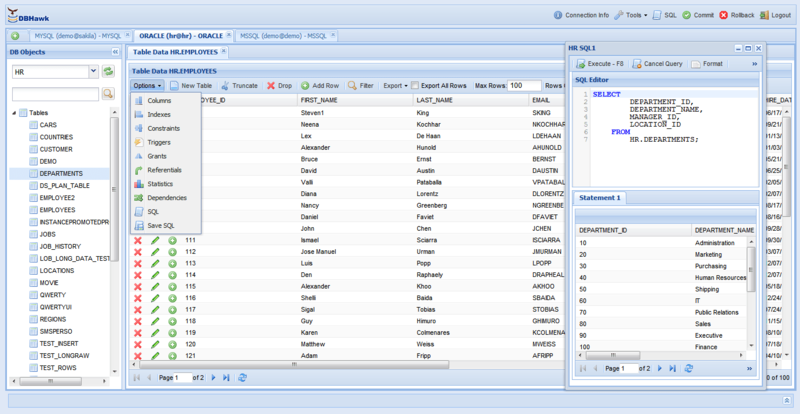 Using DBHawk Advanced Web SQL Query Editor, users can execute sql queries, format sql, view sql history, create database reports and export sql data in various formats. Using DBHawk SQL Query Scheduler, developers can run and schdule SQL Queries online, receive results by emails. DBHawk works with your current security measures such as SSL and firewalls. DBHawk provides query logging capability, which helps companies to perform user actions audit. One of their fortune 500 financial customers is using DBHawk for having this unique SQL audit capability for their more than 1000 SQL database users.